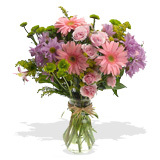 Birthday Carnations A birthday is a very important time to show someone you care and sending a birthday flower gift is the ideal way to show this affection. Choose a single birthday flower or if you would like to make a longer lasting impression choose one of our bigger bouquets. Whether you prefer a sophisticated arrangement of birthday carnations or simply a bright arrangement made up of your favorite flowers, you can be guaranteed that you are buying the freshest flowers at the best possible price at FlowerFresh.